FILE - A motorcade leaves the U.S. Embassy after U.S. officials had trade talks with Chinese counterparts, in Beijing, China, May 4, 2018. Trade negotiations between China and the United States continue early next week in Washington D.C., but analysts say after the first round, the differences between the two sides are huge. Some believe the differences are so fundamental and big that an escalation of tariffs is unavoidable. 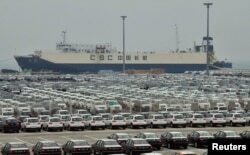 FILE - Newly-manufactured cars and a container ship are seen at Dayaowan port of Dalian, Liaoning province, June 10, 2012. 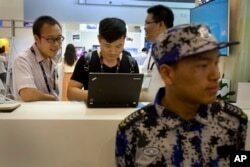 FILE - Visitors use a laptop computer at a display booth as a security guard stands nearby at the Global Mobile Internet Conference in Beijing, April 29, 2015. 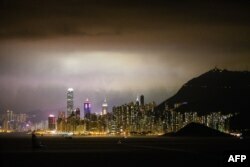 FILE - This general view taken late on February 25, 2018 shows ships sailing in the waters off Hong Kong and the city's skyline. 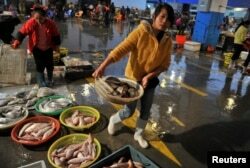 FILE - A vendor carries a basket of fresh fish at a seafood market in Quanzhou, Fujian province, China, Dec. 9, 2013. 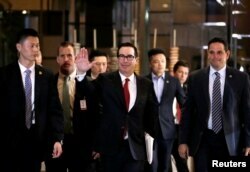 U.S. Treasury Secretary Steven Mnuchin, a member of the U.S. trade delegation to China, waves to the media as he returns to a hotel in Beijing, China, May 3, 2018. 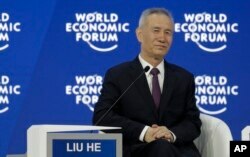 FILE - Liu He, member of the Political Bureau of CPC Central Committee, listens during the annual meeting of the World Economic Forum in Davos, Switzerland, Jan. 24, 2018.